The City of Hamilton’s building division has issued Ontario’s first six-storey wood-frame building permit, following a change to the Ontario Building Code that took effect on Jan. 1, and more are expected to follow in short order. “I think they’ll start coming pretty quickly,” Residential Construction Council of Ontario president Richard Lyall said after the change in the Ontario Building Code raised the height limit for multi-residential and commercial wood-frame buildings from four storeys to six. The change occurred following five years of lobbying the provincial government by his organization and others, including the Canadian Wood Council, Ontario Wood WORKS!, the Building Industry and Land Development Association and the Ontario Home Builders’ Association. “I think it’s going to have a huge impact and it’s going to fill a gap that we have right now in Ontario in the mid-rise segment, where traditional reinforced concrete buildings are very expensive to build,” said Lyall. “If we can go higher with timber frame, we can do it more economically and still end up with an excellent product. The Hamilton project is a 209-unit Sandman Hotel by Vancouver-based Northland Properties located at 560 Centennial Parkway that will include an indoor pool and two restaurants. Excavation and foundation work began on March 23. “We thought the first one out of the gate would be multi-unit residential, but it’s actually a commercial building, which is very encouraging,” said Lyall. It’s no surprise a British Columbia company is the first to undertake such a project in Ontario, as B.C. was the first province to introduce six-storey wood-frame construction in 2009. 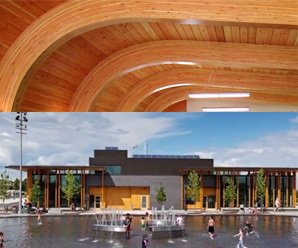 More than 250 projects have been built or are near completion in that province, while Quebec has now given its approval and Calgary is accepting permit applications for wood buildings of five and six storeys. Lyall expects changes to the National Building Code of Canada by the end of the year that will incorporate provisions for six-storey wood-frame construction across the country. Toronto, Ottawa, Kitchener-Waterloo, Markham, Burlington, St. Thomas, Barrie, Guelph, London and Clarington are other Ontario communities expected to soon begin construction on six-storey wood-frame buildings. Lyall said there’s been a bit of a delay while Ontario developers wait for the Ministry of Municipal Affairs and Housing’s Building and Development Branch to issue fire-safety guidelines for buildings under construction, which he expects by late May or early June. “It’s very green. It’s a renewable material. It has a low carbon footprint and it’s a very clean type of construction process. You don’t have a lot of concrete trucks running around. It’s less noisy in built- up areas. Building more with wood will also benefit Ontario’s forestry industry, and will give a particularly big boost to Northern Ontario’s economy. Lyall believes “the next logical step” is to allow wood-frame buildings higher than six storeys, which requires a different type of construction system called cross-laminated timber that’s being used in taller buildings in Europe. Suitable family housing has become too expensive for many working-class people in Ontario, particularly in the Greater Toronto Area, and Lyall believes mid-rise timber-frame buildings can be part of the solution while also intensifying pedestrian-friendly main street corridors where there’s access to public transportation but an abundance of low-density housing. “Ontario’s building industry is second to none and I’m fully confident that our industry is going to become quite adept at this system in very short order,” Lyall said of the challenges of building taller wood-frame structures, while adding he’d also like to see the zoning approval process become more streamlined to allow such projects to go up faster.